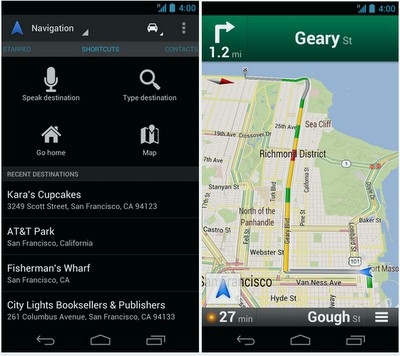 "So far, Navigation on Google Maps for Android has provided 50 billion kilometers of turn-by-turn directions...In today’s release of Google Maps 6.5 for Android we’ve redesigned the Navigation home screen in Android 4.0+ to make it easier to enter a new destination or select from recent and favorite locations by swiping left or right." The latest version of Google Maps makes some interface changes and can now take advantage of all the qHD (540x960) and HD (720x1280) displays out there on new high end phones. They specifically mention Galaxy Nexus, Galaxy S II (which should not be in the list since it has a very unimpressive resolution of 480x800), and Droid Razr. I guess the interface changes only apply to devices with Ice Cream Sandwich but the high resolution support works on Gingerbread too. I'm actually surprised they had to do anything special to take advantage of high resolution displays since they switched to using vector based rendering a number of versions ago - at least I thought. Anyway, I'm glad they did the right thing now! Anyone out there with a Galaxy Nexus have any comment on the interface changes? Did anyone with a qHD or HD device try out the maps with the new version and care to comment on any improvement?